October | 2014 | "Rent It Or Relent It"
Bill Murray, Owen Wilson, Cate Blanchette, Anjelica Huston, Willem Defoe and Jeff Goldblum. With a plan to exact revenge on a mythical shark that ate his partner, oceanographer Steve Zissou rallies a crew that includes his best and brightest. For some matter of circumstance, Steve enlisted he estranged wife, a pushy journalist, and a fanboy of the Zissou Society who may or may not be his son to bag the beast. Sure. This is gonna be sane work. Now pass the dynamite. Oddly enough, the first actor I ever paid attention to was Bill Murray. I say oddly because I was eight years old at the time. Not your average age for a budding cinephile, at least not regarding movies that cast talking forest creatures. Murray grabbed me for the first time when I saw Ghostbusters in the theater in the summer of ’84.. Ha ha! That’s gotta be a cultural exclamation point to…someone. Right? I immediately took a shine to Murray’s Peter Venkman. I knew nothing about SNL at the time; I was in bed before that sh*t ever hit the airwaves. Eight years old, remember. At that age I was convinced that Han Solo and Chewie were real people. Well, person and his Wookiee sidekick. Anyway, all I got from Ghostbusters was that I needed a proton pack and Bill Murray was funny. Witty and funny and always there with a smart remark (this hero worship was only made concrete after I saw Meatballs that same summer and later Stripes as a teen). For a reliable laugh, even when he’s trying to tackle “serious” movies, make a bee-line to whatever Murray’s starring in (yes, even Lost In Translation. Without Murray, Scarlett Johansson may not have a career. Noodle that one). You won’t be let down, no matter how lame the movie. Like my acting hero Sean Connery, a lot of Murray’s movies can get pretty lousy. But he’s always good. Now here’s the cookie. Murray has for over a decade been trying to shed his madcap CV, and try his hand as the aforementioned “serious” movies with middling results. There was the abortive The Razor’s Edge released the same time as Ghostbusters. Bill Murray? Doing grown up sh*t? What’s up with that? Does he battle gophers in that one, too? I remember this quite keenly. As I was shuffling through the kerjillion VHS titles at the local supermarket kiosk (this was the 80’s, mind you) trying to tackle a copy of Tim Burton’s Batman I saw Murray’s signature hangdog on the cover sleeve of this movie I’d never heard of. The Razor’s Edge? Didn’t sound funny to me. I didn’t know at the time it was Murray’s first foray into drama, this interpretation of Somerset Maugham’s novel. I didn’t know what a foray was, either. I kinda dug the idea of Peter Venkman trying to be an adult. Don’t ask me why; I was kid. I think it might’ve been him being a so-called adult in Meatballs to see him do, I dunno, other stuff, more grown-up like. Nah. I knew Murray was gonna be a kid regardless of what movie he was in, no matter how old he got. I was sure. There was always going to be that wit, that sarcasm and those keen facial expressions that were so much like a droopy bulldog against earnest eyes that made for good facetime. And you know what? I was right. I reported on it in Broken Flowers. It worked to great ends in Lost in Translation. And now as Steve Zissou, all those aspects come into focus. Now it’s in a “serious” aspect. But Zissou ain’t Lost in Translation. It’s a Wes Anderson film. Renowned oceanographer Steve Zissou (Murray) has a bit of a problem. More like a dilemma. Actually it’s more like a vendetta. While doing some diving and research of what could be a new species of shark—a “jaguar shark,” if you will—Zissou’s right hand man Esteban is captured and eaten by the elusive creature. Bummer. So at a symposium announcing the next plans for Team Zissou, now that a valuable member of the crew is gone and not coming back. Steve simply states he will hunt down and kill the shark that ate his friend. Revenge, a simple enough motivator. After the symposium concludes, an enthusiastic young man, lifetime member of the Zissou Society and maybe Steve’s illegitimate son accost Zissou. His name is Ned (Wilson), and seems a decent enough fella. Steve is at first taken aback by this claim, but hey, he’s gotten around so who knows? Zissou hatches a plan: if this kid is really his, why not drag him along on the next expo with him and his crew? Find the shark, kill it, trophy on the wall, revenge exacted. Drinks all around. Ned could work the camera or ask poignant questions on one of Zissou’s next in an endless parade of documentaries. Ned could carry on Steve’s legacy, give good face or just simply stroke Steve’s flaccid ego. Who knows? Wes Anderson’s movies are not what you’d call an acquired taste, like for Tom Waits for maple bacon ice cream. His oeuvre is decidedly a niche market. You don’t warm up to his stuff, you either get it or you don’t. Most of the mainstream doesn’t seem to get Anderson; even the praise he does get from critics tend to be from some Podunk periodical written by a fanboy intern who has indulged in magic brownies. Granted the left of center sensibilities yields very amusing results, Anderson’s sh*t isn’t the flavor in Columbus. “Amusing” is the watchword of Anderson’s films. They’re not outright funny. A tad screwy, yes. And please don’t use the very tired term “quirky” to encapsulate his filmography. That’s as outmoded as 56k dial-up. 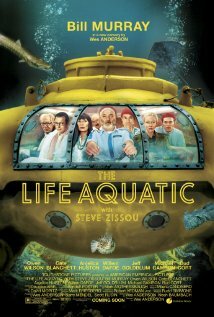 But Zissou does fall right in line with the director’s muse, audience be damned. Oddball characters, inscrutable plots and comic dialogue so dry it chafes. That’s Anderson’s stock-in-trade. And remember what I was quailing about earlier with Murray? His deadpan deliveries and dry humor are indispensible to this film. Man’s worked with Anderson on a few other projects, so he settles in here like a round peg. Like I’ve said in past reports of RIORI installments with Bill Murray, his signature slouching face and “What? Me worry?” comic delivery is priceless. His Steve Zissou is a practically perfect vehicle for Murray’s attitude and that delivery here. The guy’s a kid, forever and always, and Zissou here has got to be one of the most juvenile, spoiled drudges that has ever come off the projector. He’s a kid all right: an entitled, effete kid. He goes where his whims take him using the sea as an excuse. He’s self-important, kinda clueless and all always there to deliver the quick, albeit dry one-liner. If you’re a Murray fan you get it. The casual moviegoer wouldn’t take their time to warm up to him. I don’t think. On the other hand, Wilson is Murray’s foil. Affable, naïve and with the corniest Southern accent this side of grits. He character’s wistful and lighthearted. He also seems to be the most normal and well-adjusted member of Team Zissou. He gives Murray an excellent spring to bounce off of. Granted it’s a tiny bounce, but it works. I don’t think Zissou would’ve held together as well if it weren’t for Wilson. He’s the only character in the film that is relatable enough to ride along with, stupid accent or no. He’s has a certain subtlety about him, reserved. It’s kinda endearing. And isn’t Wilson almost always the likeable straight man in all his cinematic efforts? Yeah. Don’t argue. He can make me smile too. Stylistically, Anderson employs his usual, although welcome bag of tricks. He uses a lot of bright, often garish colors in his scenes, as if to relay to the audience that, yes, Team Zissou is a circus. And it is a circus. Surreal. There’s a lot of—let’s beat this word to death—odd, deliberate, angular shots that make the film feel at time expansive and other times confined. It’s like the whole damned mess is breathing. Anderson’s films are not designed to make money. They must fill something in his heart and soul, because the feel of this movie, like all his others, is off kilter. Despite how moviegoers these days are a cynical, jaded, looking for ironic stuff without knowing the proper definition of irony kind of crowd, his movies are not box office smashes. Not critical hits. Darlings maybe, but never outright hits. Anderson’s muse has a real affinity (or a maw that cannot be fed) for dysfunctional, comic and clueless characters doing foolish and candidly ignoble things. His flicks move at a meandering pace. The stuff’s surreal but not over the top or in your face like read this eye chart and see how low you can read. Nope. It is what it is, take it or leave it. Niche market. I like that kind of thing. Call me hopelessly biased between Bill Murray’s childlike performance and Anderson’s style of humor, I really enjoyed Zissou. Not because I’m some pretentious douchenozzle who only veers towards offbeat cinema (c’mon, if you’ve read previous installments I dug Pacific Rim AND After Earth. And I didn’t like Rushmore. There is never any accounting for taste). I like characters. I like actors. I like good actors. I like seeing them in silly circumstances sometimes. And most of the time, I like Anderson’s way of doing it. So. What to do, what to do? 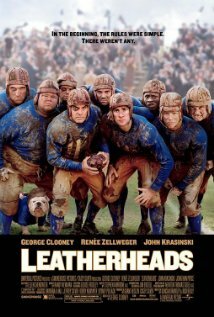 I tell ya, I’m gonna recommend this movie. Problem is that Anderson’s stuff is in that confined niche market. Are you a buyer? Rent it or relent it? Like I alluded to: rent it. But this’ll probably be a directive to Anderson fans only. Zissou is the usual fare. Catch it! Anjelica Huston seems ageless. She’s like the American Sofia Loren. Michael Gambon is a versatile actor. And busy too. 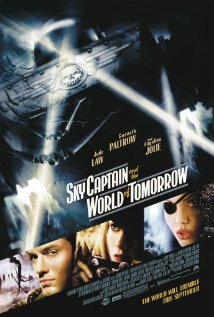 I just saw him in Sky Captain. Boy gets around. A lot of mid-80’s tech floating around in Zissou. Was this supposed to be a period piece? “What about my dynamite?” If it only it was that easy. F*ck any waiting period! I’d be remiss in my nerdy pop culture duties (see The To-Do List) if I didn’t point out the lone non-Bowie tune in the film was the Stooge’s “Search and Destroy.” Maybe it had something to do with Bowie being Iggy Pop’s benefactor on the Raw Power album? Or just did it sound cool here? I’m leaning towards numero dos. 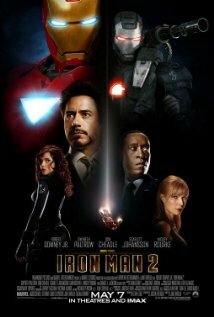 Robert Downey, Jr. returns as Tony Stark as he once again dons the armor in Iron Man 2.